The Barrier™ under concrete thermal insulation and vapor retarder product family is a high-performance, simple to use and labor saving product for all of your under-slab, under concrete, and radiant floor insulation projects. The Barrier's™ unique core material is an expanded polystyrene (EPS) with a jobsite tough, heavy-duty poly film laminated on both sides. Adding to the Barrier's™ labor saving features, NOFP added a 3" flap of film running down the sixty-four-foot length of the Barrier™ insulation with an aggressive double-faced adhesive on the opposite side of the overlap -providing a seamless vapor barrier. This extra material allows one roll to be neatly secured up to the next roll. All that your jobsite crew needs to do is to remove the release paper off of the double stick taped edge, compress the overlapping flap on top of the exposed adhesive, compress the edge - and you have a seamless system that will not allow the transfer of heat or cold and will retard the transfer of all forms of moisture increasing the overall efficiency of your radiant floor heating system. In addition to these great properties, The Barrier™ / BarrierXT™ / BarrierX5™ contains recycled EPS foam taking out thousands of pounds of material out of the waste stream. By using recycled EPS foam in our proprietary recycling equipment, The Barrier™ is also a Green Building Product. So not only do you have a great product, you also have a product that is great for the environment. BarrierHL™ and XBoard™ have recently been added to the Barrier™ product family. BarrierHL™ is a 1/4" x 4' x 96' roll of high density 25 psi material for use in slab retrofits or where you cannot afford to lose ceiling height in addition to the 3600 pounds of carrying capacity. XBoard™ gives you the higher R-values, 25 psi compression rating, as well as the features of the same film layers and tape as on our regular Barrier™ products but in a 2.38" x 4' x 8' sheet. 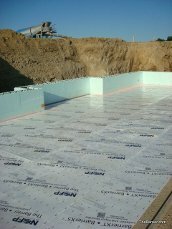 When you use the Barrier™ for your radiant heated floor, hot water heating system, under-concrete or underslab insulation projects, you'll know that you are using a high quality, effective product. The Barrier™ product family provides proven resistance to the transfer of heat and cold energy by its unique material makeup. By incorporating NOFP's unique recycled EPS foam as the core component, the material effectively creates a foam cooler "igloo" effect -keeping the heat on one side and the cold on the other. A great analogy is the foam coffee cup. What happens when you hold a hot coffee cup or ice-cold beverage? Hopefully nothing. You are able to hold the hot coffee cup or the ice-cold cup in your hand without sensing the thermal effects of the contents. A normal foam cup is thin - can you imagine how well The Barrier™ performs with a thickness that is 6-16" (3/8") thick? It goes without saying - it works extremely well - as laboratory testing has shown. What better product than The Barrier™ Under Concrete Insulation is there to use to use to control the heat loss in your hydronically heated floor, slab on slab, slab on grade, or retrofit project? The other important property for an underground insulation material is its ability to stop all forms of moisture transfer. The Barrier™ uses a recycled EPS with laminated heavy-duty polymeric film on both sides -it stops all forms of moisture transfer, try that with rigid foam sheets. In addition, The Barrier's™ multi-layer product make-up is an effective radon retarder. When proper sealing and gas infiltration procedures are used, The Barrier™ can mitigate the transmission of radon into your building. Why is The Barrier™ the fastest growing underground insulation? The Barrier™ The Barrier™ is the best selling under concrete insulation on the market today for a couple of simple reasons. (1) IT PERFORMS BETTER THAN ALL OTHER MATERIALS (2) It's cost-effective (3) It's easy to use. No other single material is a thermal barrier, a vapor retarder, and a moisture barrier all in one. Rigid foam insulation? NO. Rigid foam insulation material can crack and break when it's walked upon. Once this happens - you've limited the purpose of the product and created a thermal bridge to the cold below your slab. Can you walk on the Barrier™?- YES! 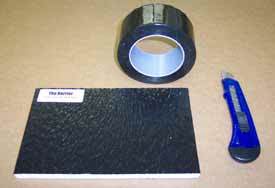 The Barrier™ is flexible and was formulated as an under-concrete insulation material for your radiant heated floor.